After the qualifying session, it was quite clear that Alonso has a bit of advantage as he was on pole position. But knowing the kind of problems that all the top 3 drivers; Alonso, Vettel and Hamilton have suffered in last few races at the start, and also a unique problem for the pole position driver to start slower then the drivers behind him for the last 7 or 8 races, it makes for an exciting race start. 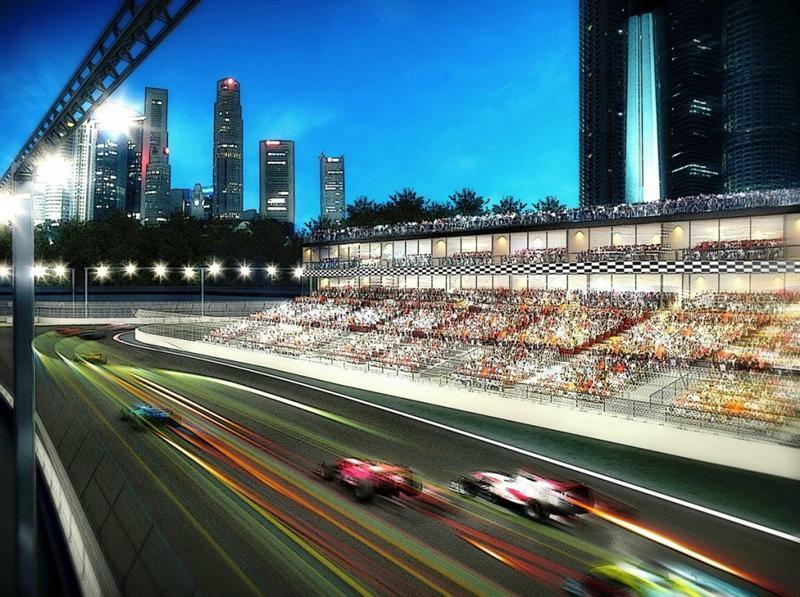 As soon as the race began Sunday night on the streets of Singapore, no such problem was being shown by any of the top 3 drivers, as they all made a great start. While the whole grid made the first 3 turns safely without any major contact. At the end of first lap, Liuzzi of Force India has to retire after a broken rear suspension. Which cause a Safety Car period as the car was needed to be removed from the track. RedBull tries a gamble by calling Webber in for a pit stop to put the hard tires on his car, and he was the only one of the top 5 drivers to take a pit stop during the SC period. SC pulled in at the end of Lap 5 and the race restarts, Webber who was 11th after his pit stop overook Virgin’s Glock for 10th, and joins the battle for 7th behind Rubens, Michal and Kobayashi. On Lap 7, Trulli suffers a puncture and head back to pits for new tires, giving up his 18th place, Webber overtakes Kobayashi for 9th. On the front Alonso and Vettel were starting to put fast laps as they start to increase their lead over both McLarens behind them at 3rd and 4th. Webber overtakes Michal on lap 11 as Michal goes wide on turn 5 and takes 8th behind Rubens. Glock is on 11th forming a train of several drivers behind him including Sutil, Hulkenberg, Massa, Petrov, Buemi and Alguersuari. Sutil was the first driver to overtake Glock on lap 15 and after that in 2 laps all the drivers that were behind had overtook him. Jarno Trulli retires on lap 28 because of a mechanical problem. On Lap 29, Hamilton became the first of the top 4 runners to pit for his scheduled stop, he emerges way behind Webber, who was told by his engineer on radio earlier that he was racing against Hamilton. Alonso and Vettel came in the pits together on lap 30, who were followed by Button into pits handing the lead to Rosberg, Vettel was lucky not to stall his car during the pit stop. A lap later Rosberg pits for his scheduled stop, giving the lead back to Alonso with Vettel still behind him, on the same lap Michal pits while a lap earlier he had suffered after some contact with Kobayashi. Kobayashi retires on lap 32 when he crashes in the barriers on turn 18; he was not only to crash at that place as Bruno Senna also crash his car in the back of Kobayashi’s car a few seconds later. SC deployed as both cars need to be removed from that corner. Kubica and Barrichello take their scheduled stops, behind SC, Alonso was 1st, Vettel 2nd, Webber 3rd thanks to the team’s pit gamble, while Hamilton and Button were 4th and 5th respectively. SC goes back into the pits on lap 35 and the racing starts again, on lap 36 Hamilton and Webber collides as Hamilton tries to overtake Webber, Hamilton retires while Webber asked his team to check any damages as FIA Stewards start investigating the incident, later the official statement came stating no penalty has been awarded. Webber was lucky as the post race inspection by Bridgestone shows that his collision with Hamilton has pushed the tire from its normal mounting position and it was 5mm approximate between inner tire and rim, if it had slipped over that distance the tire would certainly loose pressure. Just a lap later Michal and Heidfeld have a collision which left Heidfeld retiring from the race while Michal suffers front wing damage as he returns to pits for the new wing leaving a trail of sparks caused by the broken wing. This incident was also investigated and deemed as racing incident just like the Webber/Hamilton incident. On lap 46, Kubica made an unscheduled stop for a suspected puncture and came out behind Alguersuari on 13th position, from lap 47 to lap 55 he overtakes six cars including, Alguersuari, Buemi, Petrov, Massa, Hulkenberg and Sutil to take 7th position on the track. During this whole action Glock retires on lap 52. In the ending stages, Buemi tries to overtake Kovalainen, and in the process collide and sent Kovalainen into a spin, the crash also damage his car’s fuel line and the back of the car erupts in flame, as he tries to nurse his car to a safer location. He stops his car on the start/finish straight, before attempting to extinguish the fire himself. This caused a Yellow flag on the last 3 corners with the last lap just started by Alonso leading Vettel as they circulate the last time around the Marina Bay Street circuit. Alonso takes the Chequered flag leading Vettel by 0.293 secs, Webber takes 3rd with 29.441 secs behind. Button takes 4th, Rosberg 5th, Barrichello 6th, Kubica 7th, Sutil 8th, Hulkenberg 9th, and Massa 10th are the only drivers that finished on the lead lap. Petrov, Alguersuari, Michal and Buemi finishes a lap down, while Di Grassi was 2 laps and Kovalainen who retires was classified as 3 laps down. Alonso takes the perfect score honor by taking pole, winning the race and posting the fastest lap of the race with 1:47.976. 8 drivers were retired from the race.